As first responders we have a special bond that the average citizen has a hard time understanding. Yet we know that those in the fire service and those in law enforcement place their lives on the line to protect the people and property of our village and the surrounding area. 2017 will mark the 40th Anniversary of the line of duty death for Menomonee Falls Police Officer John Taylor. Officer Taylor was killed August 6, 1977 while participating in an effort to apprehend a 17-year-old who was being pursued by a Wisconsin State Patrol Officer. The youth was attempting to elude the State Patrol Officer when his vehicle struck Officer Taylor's squad car broadside. Officer Taylor was ejected from the squad car and sustained head and internal injuries. At the time, Officer Taylor was 36 years old, and was married. He was an eight year veteran of the Menomonee Falls Police Department. In 1996 Chris Cosgriff, a James Madison University freshman, read a Washington Post article about the release of a murderer, convicted of slaying two Prince George's County, Maryland, police officers. Upon learning that this violent criminal who had taken the lives of two of America's finest served only 16 years for this heinous act, Chris was compelled to find a way to honor these and other fallen officers. Thus, the Officer Down Memorial Page, Inc., (ODMP) was created. In the early stages of development, the ODMP honored only law enforcement officers who had been killed or wounded in 1996, but quickly expanded to include officers killed in the line of duty dating back to 1990. Then, with the help of the National Law Enforcement Officer's Memorial Fund, Inc., the site gained access to information about thousands of heroes who had given their lives in the line of duty since the 1790's. The ODMP, which is dedicated to honoring the lives and sacrifices of fallen heroes, has continued to develop over the years by taking great strides to connect people everywhere to those who have given their lives to serve and protect the rights of American citizens. The online memorial expanded internationally when in 1997, ODMP Australia was created. By the end of 1997 Canada would also be among those honoring its fallen officers. The following year marked the creation of ODMP New Zealand and ODMP Central Europe. The ODMP has added unique features to pay tribute to officers and their families. 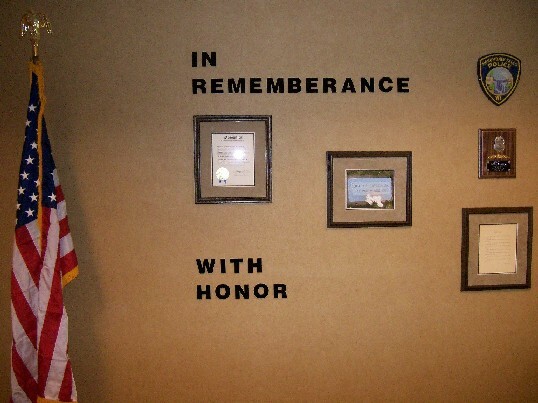 When available, photographs of officers and images of agency shoulder patches have been added to each memorial so that visitors can view the faces of these extraordinary individuals. In addition, visitors can leave a lasting message to these heroes in the "Reflections" forum. Although much can be learned from the biographical information provided for each officer, it is through these "Reflections" that one can fully understand the impact that each of these heroes had on those who knew and loved them. In 2000, the Officer Down Memorial Page, Inc., was granted status as a 501(c)(3) non-profit organization. This status allowed the ODMP to greatly expand its role in honoring America's police officers killed in the line of duty. In 2010 the ODMP was awarded a grant from the U.S. Department of Justice, Bureau of Justice Assistance, to provide line of nationwide line of duty death notifications and provide resources on benefits available to survivors of fallen law enforcement officers. It is the hope of all those involved with the ODMP that each name added to the site will be the last. Until and after that day comes we are committed to honoring those souls who have made the ultimate sacrifice in the name of justice.